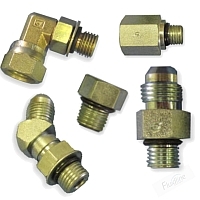 SAE Straight Thread O-Ring Boss (ORB) Hydraulic Fittings (FLC 1200 series) by Fluidline Approved Vendors are recommended by the NFPA for optimal leakage control in medium and high pressure hydraulic systems. The male fitting has a straight thread and O-ring while the female port has a straight thread, a machined surface (minimum spot face) and a chamfer to accept the O-ring. The seal takes place by compressing the O-ring in the chamfer while the threads hold the connection mechanically.